Two weeks away from the technical start of summer and the mountains are just beginning to sport their spring green. But what a lovely spring green it is – so brief and yet dazzling like little jewels under the intense spotlight of the high sun. After reading about all manner of “indicators” for black morels in the mountains, I’ve come to the conclusion that it basically means “when spring arrives and things start growing”. Makes sense. I’m seeing tiny pink calypso orchids, pasque flowers (still! ), aspen leaves, oregon grape in bloom, false morels (toxic) and on and on and on. It’s wonderful in part because it isn’t terribly hot yet, which means foraging is more bearable when I’m crawling through forest debris. Come chanterelle and porcini seasons, I get a little cranky when the mercury rises. Back here on the Front Range, the morels in my area are taking their time. I’ve found a few early bolters, but that’s about it. 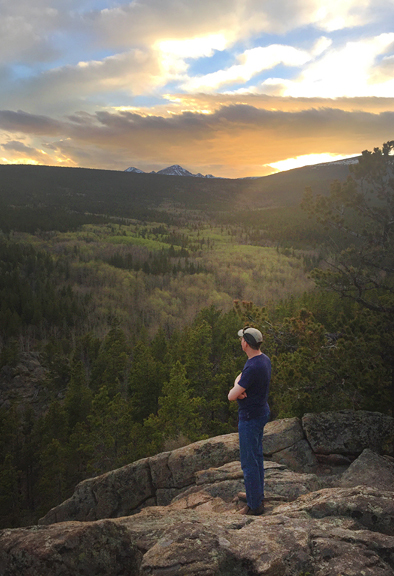 I’ll probably miss the start of the proper flush, but I’m sharing my trail observations with my shroom buddy, Erin, because I want to know how the areas progress while I’m in Crested Butte and because I want her to get some black morels! 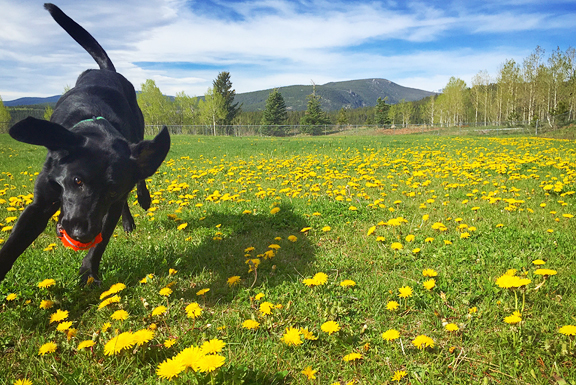 Meanwhile, Neva is getting lots of running and playtime not associated with foraging morels. She makes it infinitely harder to concentrate on finding mushrooms and then when we do find them, she (like most dogs) will invariably and unwittingly step on at least a couple of them. I think we’re all quite happy to see the progression into spring because we know that summer will arrive like the flick of a switch. Good things happen in the mountains when the days are warm. I brought about half of my morel haul home to Nederland for recipe testing. 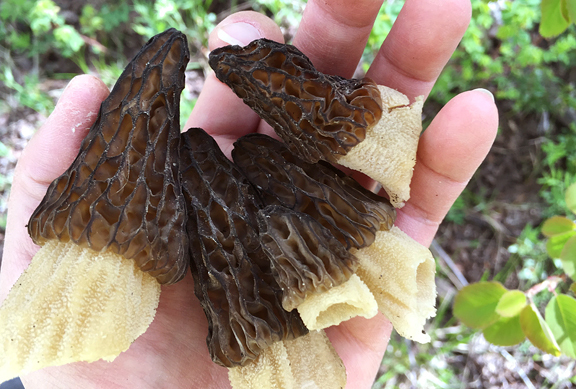 The rest of the morels were either consumed in Crested Butte or given to devoted mushroom foragers who had never tasted black morels before. Oddly enough, when I was passing through my local Costco down on the flats, I found black morels for $8 per half pound. That is quite a good deal. I picked up two boxes out of curiosity and to supplement my supply for a morel recipe testing fest over the weekend. The store-bought morels were picked wild in the Pacific Northwest and they had good flavor, but they also came with plenty of small worms who apparently also appreciate the flavor of morels. I hate mushroom worms. Thankfully, my own foraged black morels were worm free and really clean. 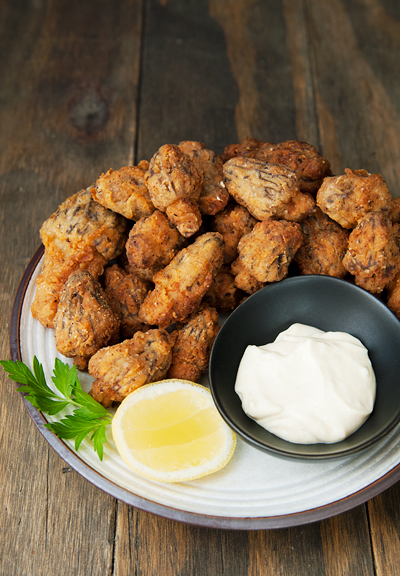 I used the small ones for this classic recipe of fried morels. Also, I made a half recipe (the recipe below is the full recipe) to conserve my limited supply of morels. 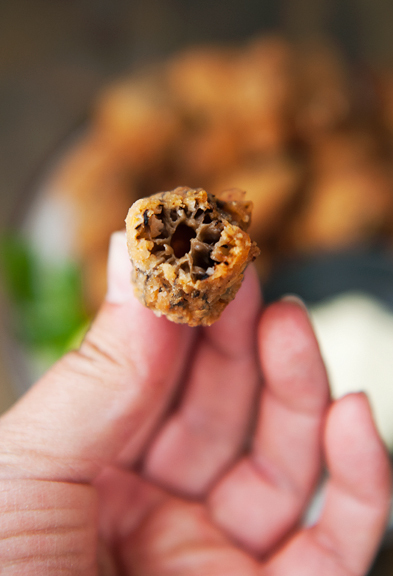 There is a wide swath of this country that insists the only way to eat morels is fried. I think morels can be enjoyed in a variety of preparations, but I’m not going to turn my nose up at a fried morel! So I went in search of a good recipe. When it comes to wild mushrooms, I find that Hank Shaw’s blog, Hunter Angler Gardener Cook, is a great resource for solid information and reliable recipes. Most of the time, I don’t advocate washing mushrooms if you can avoid it. I know various voices of authority on the matter say it doesn’t make a difference, but I think it does when it comes to getting a nice browned sear on a porcini or chanterelle. 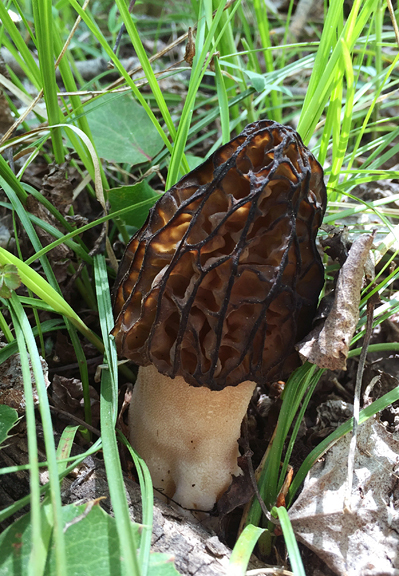 But morels… morels can be filthy. Those pitted caps equate to a whole lotta surface area to accumulate all sorts of debris and unwanted dinner guests. 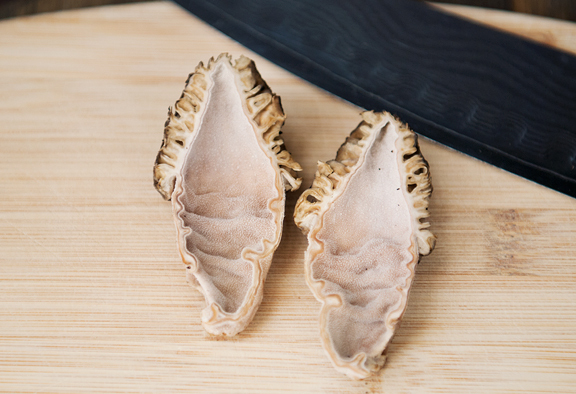 The method I have been using suggests slicing the morels in half (that way you also know if anyone has taken up residence inside that nifty hollow), placing them in a bowl of cold water, and then rinsing each one out under a stream of cold water. Drain them in a colander then pat them dry on paper towels. You can save that rinse water to pour into a “morel-friendly” part of your yard in the hopes of seeing some pop up next season. I’ve noticed a beige color residue on the vessels I use to store the morels – those are spores. I know this because while a cleaned batch of morels were drying in the sun, we saw plumes of superfine particles puffing up from the mushrooms! Coolest thing ever. You can see the video on my instagram. Washing the morels is (for me) the most time-consuming part of the recipe. The rest is like the blink of an eye. 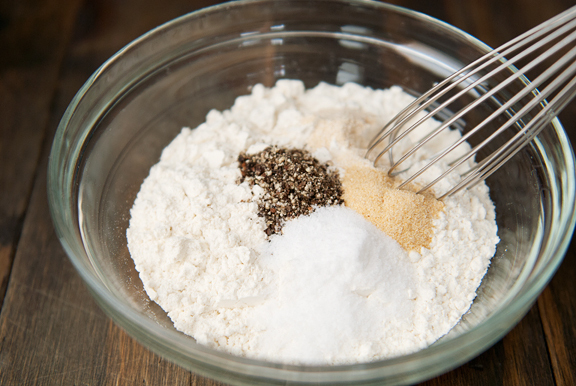 Mix the dry ingredients together in one bowl. Mix the wet ingredients together in another bowl. Start heating an inch of vegetable oil (or lard) in a large frying pan. The nominal temperature is 350°F. Get your morels ready for some dippy dippy. It helps tremendously to have two people doing the dipping. 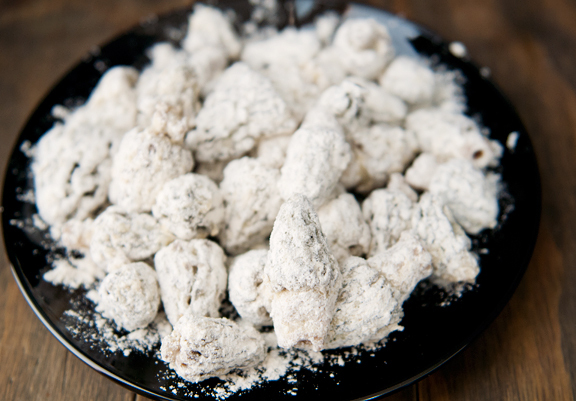 One person should handle all flour dips, and one person should handle the egg dips. If you do it all yourself, you wind up with a very thick layer of batter on your fingers that will require regular cleaning off. Of course, if you are especially coordinated and talented and never need a clean hand, then flour dip with one hand, and egg dip with the other. 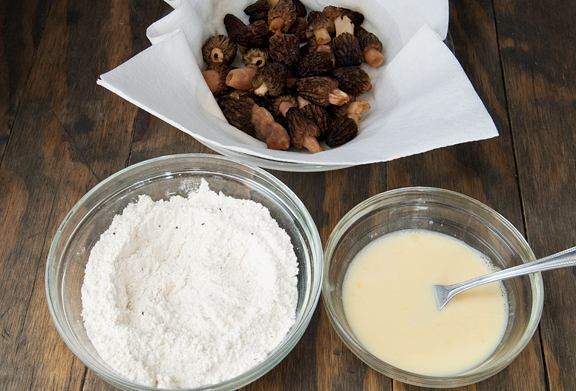 Batter and flour your morels all in one sitting rather than dropping them into the oil as you batter each one. The reason is so you can keep track of the cooking time. 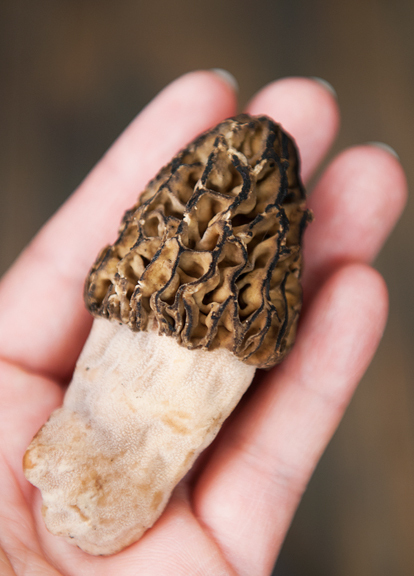 Black morels should not be eaten raw or undercooked because they can make you pretty sick. To ensure they are all cooked thoroughly, drop them into the hot oil at the same time and cook each side for 3-4 minutes. You might have to work in batches to avoid overcrowding in the pan. These crunchy nuggets of earthy umami goodness are best eaten hot, but they’re also pretty damn good warm or even cold. We ate them with a squeeze of lemon and garlic aioli, but they are just as delicious straight up. I especially like how this batter isn’t too thin or too thick – it’s just the right seasoning, crispness, and amount for the morels. 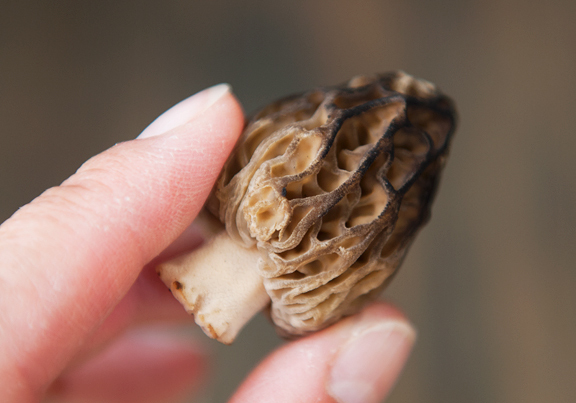 Slice large morels in half lengthwise, leave small morels whole. 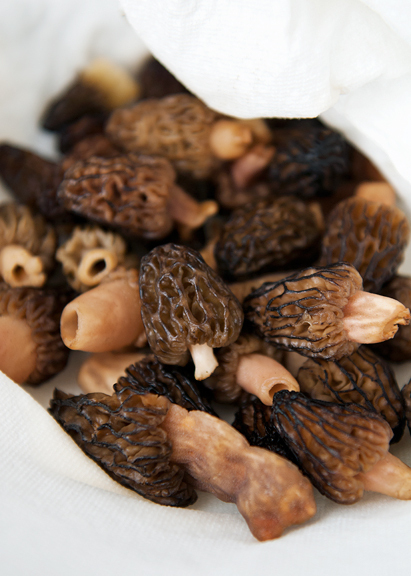 Dunk the morels in a large bowl of cold water, then rinse them of any debris. 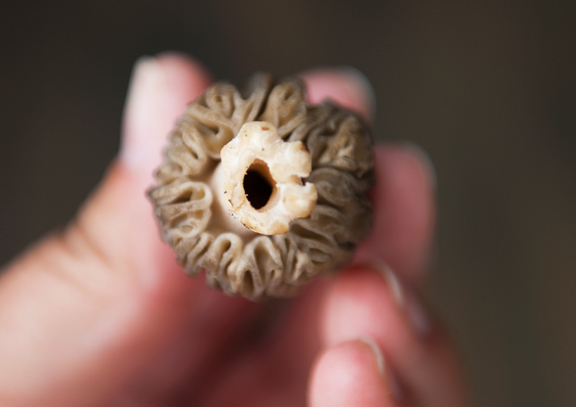 For the whole morels, it helps to let the hollow fill with water and shake the water out of the cavity. Arrange the mushrooms on paper towels and pat them dry. 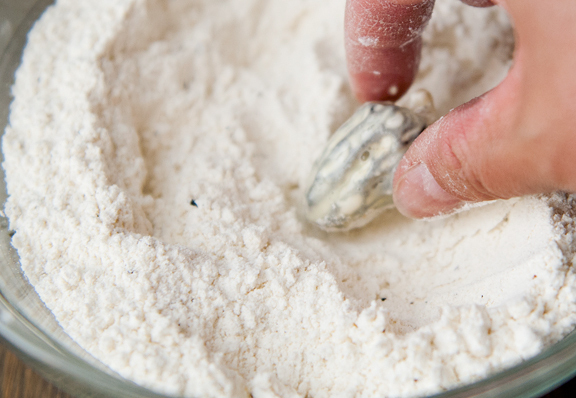 In a medium bowl, mix the flour, salt, black pepper, garlic powder, and onion powder together. 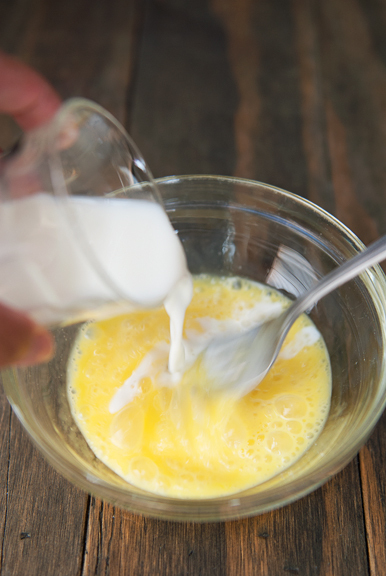 In another medium bowl, scramble the eggs and beat in the milk until blended. 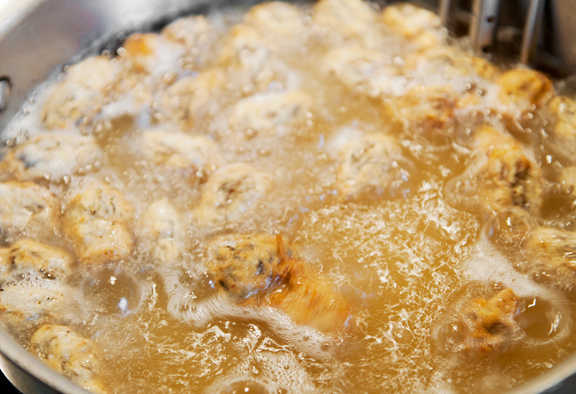 Heat an inch of vegetable oil in a large sauté or frying pan to 350°F. 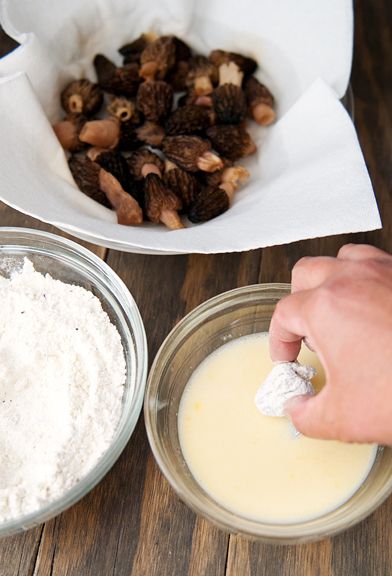 While the oil heats, begin coating each morel or morel half in the flour mixture. Dip the mushroom in the egg mixture, letting any excess drip off. 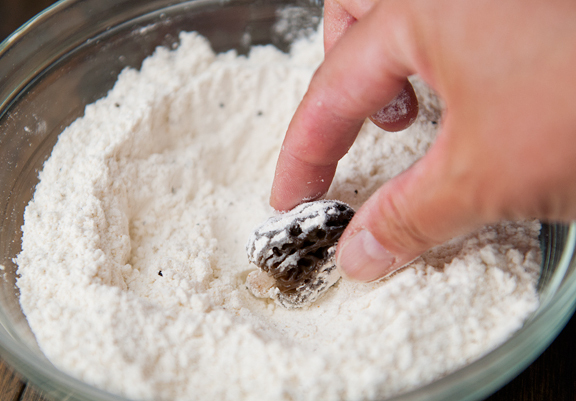 Then roll the morel in the flour mixture once more. Repeat for all of the mushrooms. Fry the mushrooms in the hot oil for 3-4 minutes on each side (a total of 6-8 minutes). Don’t overcrowd the pan. You may have to fry in two or three batches. [Make sure to cook the morels thoroughly because raw or undercooked morels can make you ill.] Remove the mushrooms from the oil and drain on paper towels. Serve hot with lemon and garlic aioli. Serves 4-6. 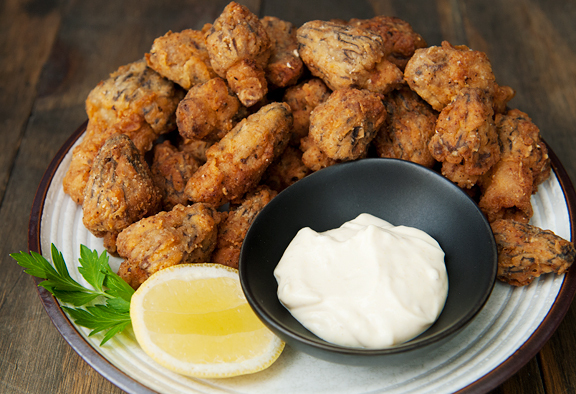 Oh my goodness, do I love fried morels!! I was ready to go to Costco, until you said worms! I love mushrooms, and these look delicious! 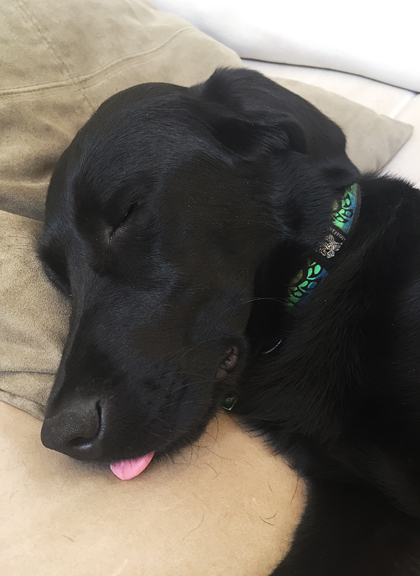 and there is nothing like a picture of a puppy dog sleeping WITH their tongue out…. tired puppy. These sound familiar to a recipe my family and I have used for years. Will have to give this a try too! I would have never seen this until a friend sent me a screen shot of someone posting it – not sure what the intentions were – but very interesting. Thanks for posting – and sharing! Ha! Our national (Czech republic) speciality. We pick almost every kind of mushrooms and yes, this is one of our traditional ways how to prepare/serve them. Flour / eggs+milk / breadcrumbs. You could be a czech in a minute! We live in a small city, and I don’t know where to get them, or even if they grow here. Would the dried ones have spores? I would love to take a mushroom hunting course, but the only one I could find has a waiting list of about 6- 7 years. So I guess I’ll just have to rely on the store. Hi Jen! 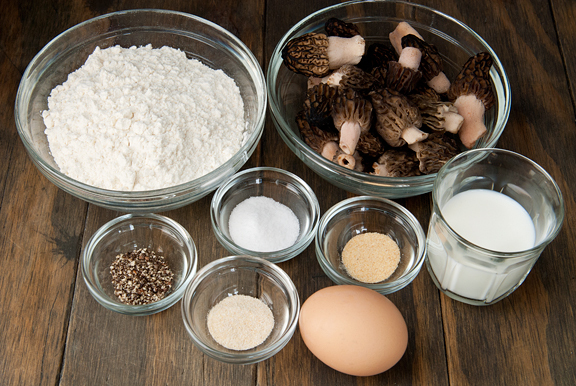 I am hoping to find some morels so that I can try this delicious recipe! We are back in Ned for the Summer. Any chance you can give me a hint on where to look in our area? 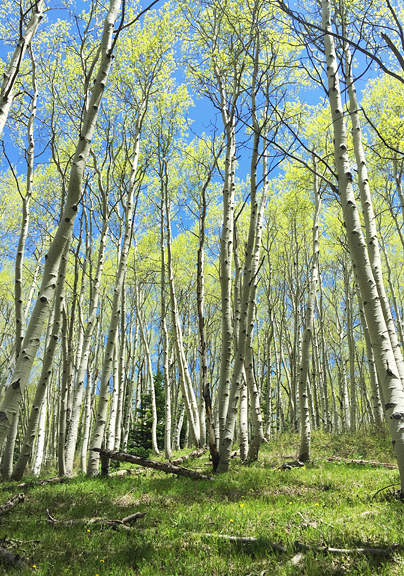 I talked to a mushroom expert today who thinks it should be prime yellow morel season up here around cottonwood trees, with blacks following any day now in more of a pine/aspen habitat. He also mentioned arnica as a timing indicator for black morels, and we have huge swaths of it popping up in our woods now on Sugarloaf Road. Not blooming yet, though. I am talking to this guy about conducting a foray for my family Sunday – would you or your friend Erin want to go? Kristin – ha ha! Well, I’m pretty sure most people have eaten a worm or two unbeknownst to them :) But it is something to be aware of and it’s not that big of a deal if you’re okay with cleaning them. Michal – :) Maybe I should visit and learn how to prepare mushrooms the Czech way! Charlie – hi! I’m actually Jen, not Celia :) Dried ones might or might not have spores. I imagine they must have SOME. When you rehydrate the mushrooms, save the water as I bet there might be some spores, and then you can pour it outside if you have the right kind of morel-growing environment. Then cross your fingers and wait a year :) However, I’m not sure how well the dried morels (rehydrated) will fry. 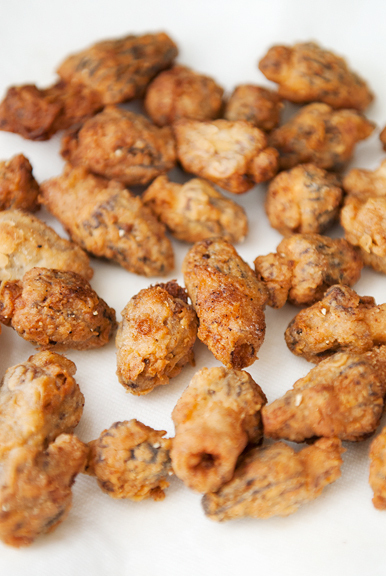 But there are plenty of other great recipes out there that use dried morels! Valarie – thanks for the invitation. It is a tricky thing finding the morels and I’ve had much better luck here in Crested Butte than in Nederland so far. I hope you all have a good foray!